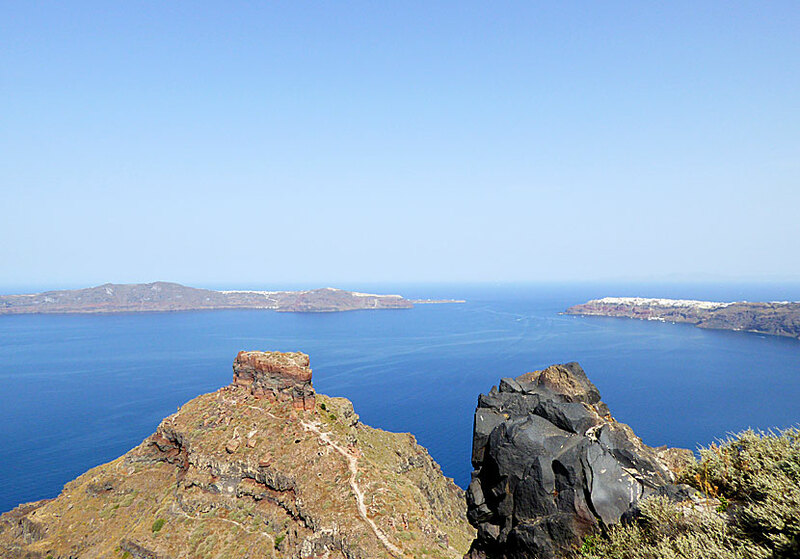 If you follow the cliff edge from Fira to the north, you have a lovely panoramic view of the caldera, along the way you pass the small tourist resort of Firostefani where many charter hotels are located. After 20 minutes you will come to Imerovigli. Of course you can also drive here. Imerovigli. To the left you see Oia. Imerovigli was partly destroyed by the latest volcanic eruption in 1956. The village has since then been renovated and is now home to some of the most beautiful hotels and traditionally built houses in Santorini. Café with a view in Imerovigli. Along the lip of the caldera is a narrow alley that extend through the village. On both sides of the alley lies cosy hotels, cafes and tavernas. 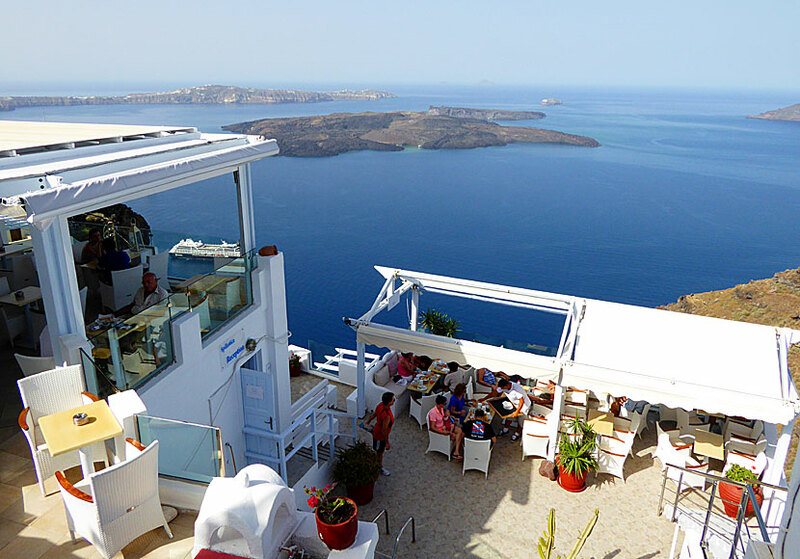 Many villages in Santorini offers magical views overlooking the caldera, but the question is whether or not the view from Imerovigli is the most beautiful. 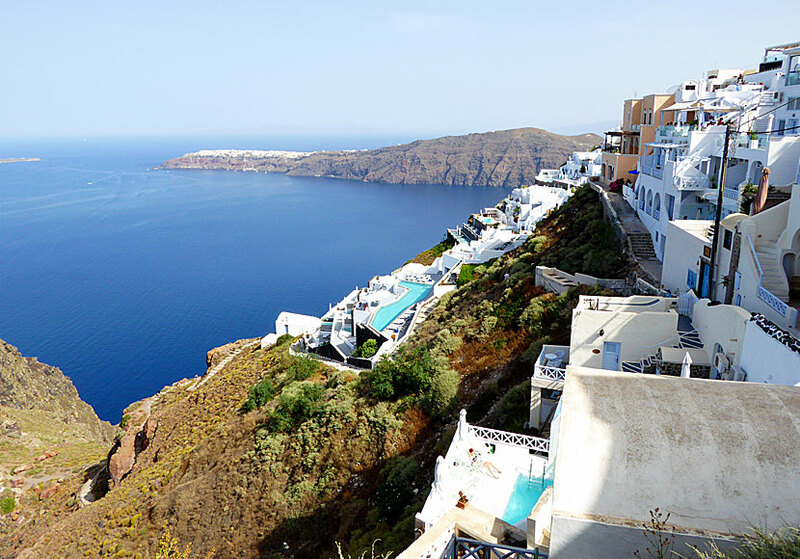 The houses in Imerovigli literally balances at the edge of the cliff, and if I could afford it I would be more than happy to spend a few nights in one of the hotels that like birds' nests clings to the cliff side. Imagine to sit and swing the legs from the edge of the pool and feel the sea's attractive force 300 metres below. Wow! View of the caldera and volcanoes from Imerovigli. In front of Imerovigli lies the rock of Skaros. Skaros was inhabited during the Middle Ages when there was a castle built on top of it that offered protection against pirates. Almost all vestiges of the castle, and the other buildings that stood there, have unfortunately been destroyed during the many earthquakes that hit Santorini. It is possible to visit Skaros, there is a path leading from Imerovigli. Skaros rock below Imerovigli. Thirasia in the background and Oia to the right. 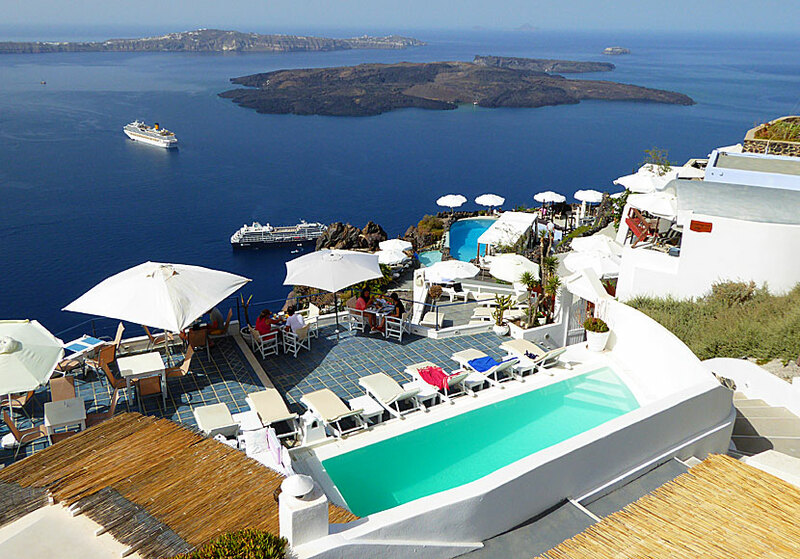 The question is whether there are more good hotels in Imerovigli than it is in Fira and Firostofani. If you are going to stay here, the difficulty is not to find a hotel, the difficulty is to choose which hotel. Unfortunately, I can not advise because I have not stayed in Imerovigli. But I have gathered a few tips, and it is Absolute Bliss, Andromeda Villas and Villa Lukas.